Talk about knocking it out of the park the first time up at bat. 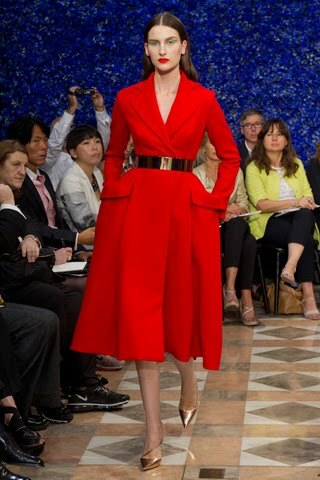 Raf Simons, the Belgian-born new creative director at Christian Dior showed his beginning haute couture collection for Fall 2012 in Paris on Monday and I am in love. I was not a big fan of his work at Jil Sander, his last head designer position, so I was slightly worried about what he’d do at Dior, but there were so many gorgeous looks, I think he found the right home, and Bernard Arnault, chairman of LVMH (Moët Hennessy Louis Vuitton), which owns Dior, picked the right man. A super chic updated version of Dior's 1947 "Bar Suit." My favorite part of the whole thing is the way Simons channeled Christian Dior himself, taking the Bar jacket, a key component of Dior’s 1947 New Look, and updating it for today. You see it in every one of the looks where there is a nipped-in waist that then flares out to those stunning pockets. Another dress I want, along with the blue and yellow shoes. I love the silvered gray flowers paired with hot pink polka dot! I love Simon, but you know me, a born baroque and madly in love with GALLIANO for ever. Gorgeous looks. And I love that second suit like nobodies business! Oh, I love the black and blue dress! We've got to find the slip for your black eyelet. I'm looking. The pink dress is my favorite - but they are all gorgeous, of course. WOW! Where do you ever go in REAL life in these clothes unless you are a REALITY STAR HOUSEWIFE?? I wish someone would design clothes for my plain vanilla life in Portland, Oregon. They look nice like a BMW looks nice but I don't drive one. I think the better question is "which of these looks do you not like? ", because all of them are absolutely gorgeous. What would I be willing to sell to own one of these timeless-yet-current pieces? As for wearing these pieces, there are several cocktail dresses that are appropriate for any dining out option. That black suit would be intimidating in the best of ways for any business meeting or chance encounter with an ex-boyfriend/husband. No reality star has the personal panache and inner elegance to even touch the hem of these beautiful garments. Wow! 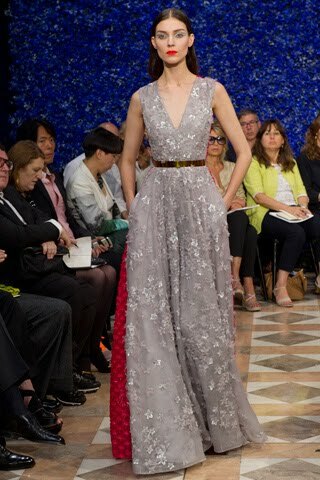 I adore them all but to pick a favorite it would have to be the dress with silver gray flowers and it even has pockets. I agree with you Jill, out of the park. And like you, I wasn't too thrilled with recently Jil Sander. But he did it- I feel the Dior luxe but modern and very wearable. In my BMW.